Starbucks is a hugely successful, highly recognisable brand. Consumers mainly associated Starbucks with enjoying their coffee in a café or on the go. Starbucks was keen to capitalise on their brand awareness and popularity and encourage consumers to enjoy their delicious coffee from the comfort of their own home. The main aim of the campaign was to raise awareness of Starbucks packaged coffee in major supermarkets and to drive in store voucher redemption with measurable results. Magnetise Media adopted a highly targeted approach, focused on reaching and converting regular coffee drinkers. An engaging advert was created and run across targeted websites. Once the advert was selected, users were presented with a number of qualifying questions. On completion, a personalised email was sent in real-time. 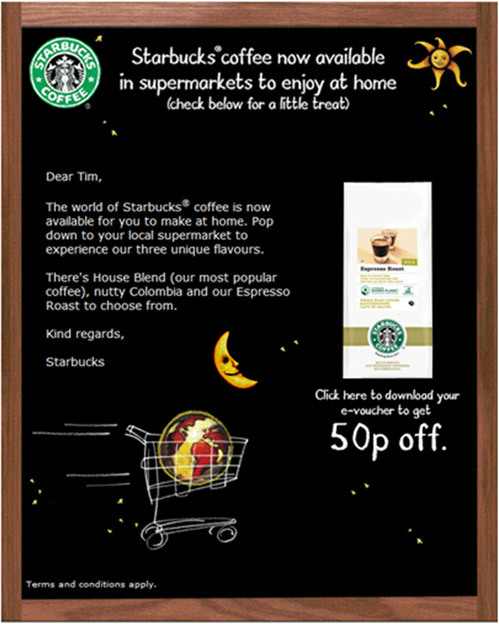 The creative email raised awareness of the Starbucks packaged coffee blends and contained a money off voucher with a unique code. Offering consumers with a financial incentive helped to convert sales in supermarkets and the use of a unique code ensured a fully traceable campaign with real, tangible results. The Starbucks campaign proved hugely successful as it directly engaged with frequent coffee drinkers. Magnetise Media’s targeted email exceeded expectations with an open rate of 89% and well over a quarter (29%) of recipients took up the offer.